The German state of Bavaria has ordered Christian crosses to be placed at the entrances to its public buildings. Premier Markus Söder said crosses should not be seen as religious symbols but as a "clear avowal of our Bavarian identity and Christian values". But opponents said the ruling Christian Social Union (CSU) was trying to score points ahead of October's election amid fears of a rise of the far right. Crosses are compulsory in public school classrooms and courtrooms. The decree, which comes into effect on 1 June, will not affect municipal and federal government buildings in the predominantly Roman Catholic southern state. 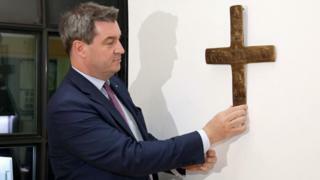 "The cross is a fundamental symbol of our Bavarian identity and way of life," Mr Söder said in a statement (in German). "It stands for elemental values ​​such as charity, human dignity and tolerance." He denied the measure violated constitutional rules about religious neutrality and, on Twitter, said he had placed a cross in the lobby of the state chancellery in Munich. The decision to display the crosses only in the entrance of the buildings and not in offices and rooms may be an attempt to avoid the controversy sparked by the move to place the religious symbol in classrooms and courtrooms, observers say. The CSU, sister party to Chancellor Angela Merkel's Christian Democrats (CDU), are wary of a challenge from the anti-immigrant Alternative for Germany (AfD) in the local election. Bavaria was targeted in several of the bloody attacks which hit Germany last year, some carried out by Muslim migrants, and concerns over immigration fuelled support for the AfD, allowing it to enter the German federal parliament for the first time last year as the third-largest party. The CSU are hoping to avoid losing their absolute majority in the regional parliament and some electoral opponents saw the announcement as a political manoeuvre. "I have to say that the cross is too good to be exploited here for partisan games," Florian Streibl, parliamentary executive director of the Free Voters, was quoted by Süddeutsche Zeitung newspaper a saying. Jan Korte, leader of the Left party's parliamentary group in the federal parliament, said: "Why can the CSU never think of anything that brings people together, instead of trying to divide the country at every level?" "Söder's anti-constitutional crucifix decree is not just the clumsiest election campaign, but also the exploitation of religion for personal reasons," he was quoted by German broadcaster DW as saying.